The What: Tactical Fiber debuted two new fiber-based transmission systems for cameras equipped with built-in NDI or NDI Converters. Using the new system, a camera can send NDI/IP signals and receive 20 watts of DC power up to 1,000 feet away from the video village over hybrid tactical fiber cable. 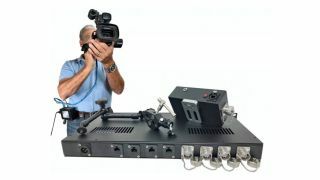 The What Else: It is equipped with four IP fiber media converters and four DC power supplies for connection to four independent CamLink Camera Units. I/O on the CamLink base unit includes four hybrid fiber sockets for connection to four CamLink Camera Units over tactical fiber cable and four Cat-5 outputs for connection to the NDI/IP component (switcher) at the video village. The Bottom Line: The Tactical Fiber Camlink is designed to enable long-distance runs of tactical fiber cable to cameras and NDI converters of up to 1,000 feet using camera power and longer distances with battery power. The system with camera power includes a CamLink PLUS 1 RU rack-mount base unit which handles up to four PLUS Camera Units. This unit receives NDI encoded video and provides DC power for up to four additional camera Units and NDI accessories.